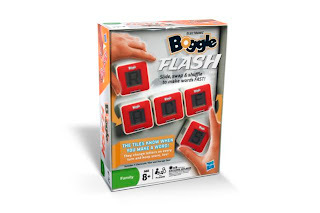 I was delighted to receive the game, Electronic Boggle Flash (Hasbro) to review recently. You know how much The Book Chook loves word games! I describe a couple of old favourites in The Book Chook Bag of Tricks, above. The idea of Boggle with a cool new electronic aspect had me flapping my wings up and down impatiently. I think we actually looked at the invention that enabled this toy in my February article, Siftables. The object of Boggle Flash is to slide, swap and shuffle tiles to make words fast. There are five tiles, so you can make five letter words (or less). Each tile is about the area of a book of matches, but chunkier. To play, you need to sort the letters out so they make a word, joining them end to end in a row. If it's a true word, the game beeps and flashes up a new set of letters. You can play an online version of one Boggle Flash game at the Hasbro Family Game Night website. Number one for me was the electronic aspect. To have tiny computers sensing that I have made or not made a word like this "boggles" my mind. Kids, of course, will take it in their stride, but they'll love it too. I love games that actually get my mind working and have me exercising my thinking muscles. Boggle Flash isn't easy. Confession: I sometimes got groups of letters that had me scratching my feathers and then slapping the table when I saw the answer at last. But it's a great mental workout. The game play was simple enough to pick up readily, but complicated enough to hold my interest. Working against a timer, random letter generation and another player added extra dimensions. The game came with batteries provided and they all worked! Although it comes carefully packaged in a cardboard box about A4 sized, the game tiles and instructions can be packed into the extra, compact and sturdy, plastic box provided. This makes it easily portable and keeps the tiles safe. I think Boggle Flash would be ideal for play on a fold down tray in a plane, a stable table in the back of a car, on the floor of a bedroom or around the dining table at home. It's a game that involves kids in developing literacy skills and engages them in word play, while providing fun and the opportunity for interaction with other players. The company recommends the game for ages 8 and up. I see no reason a bright six-year-old couldn't play by looking for two or three letter words. It would make an excellent game for the whole family, as it has versions for one, two and more players. If you're in the US, try looking for Scrabble Flash - same game, different name. Joyce Grant also reviewed it on Get Kids Reading where you can check out her opinion. Now all we need is another online version so Canada can play Australia! I can see us playing this on our Family Fun Nights! How much is it? Do you know? Sorry Kelly, I don't. But the Hasbro site above says retailers include Target and Big W, so keep an eye open. We use Boggle in class as a literacy center, but the noise of the letter dice being initially shaken really distracts the independent (quiet) workers. I'm thinking this could cut out the sound?